The scent of baking cookies in the oven is a blessing in any home. My lemon yuzu cookies are no exception. What is exceptional, however, is the enhanced citrus aroma the day after baking. 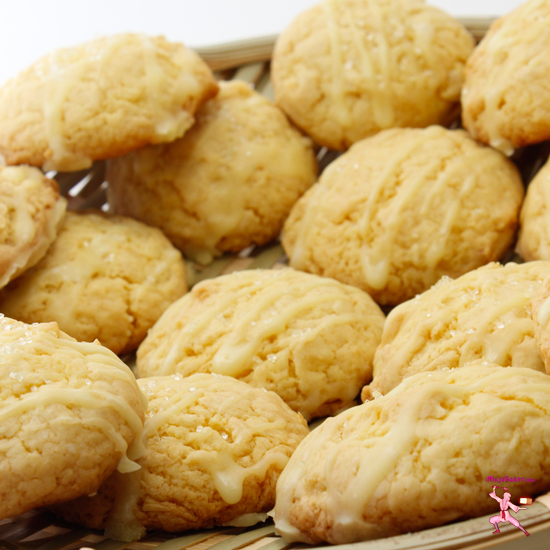 The soft citrus cookies with the perky glaze crunch remain heavenly on or after baking day! Ninja Note: If you add more than 2 tablespoons, you’ll probably need to drop in a tablespoonful of coconut flour to compensate for the extra liquid. Vigorously stir together the cake mix, oil, eggs and yuzu juice. Squish as many lumps out as possible with a big mixing spoon or spatula. With a handheld mixer, beat the ingredients until smooth. Drop dough onto a parchment lined cookie sheet using a mini ice cream scooper or a tablespoon-measuring spoon. Bake at 350 degrees for 14 minutes or until the edges of the cookies appear golden brown. Whisk together the powdered sugar and yuzu juice until smooth. After the cookies have cooled for about 3 minutes, drizzle the glaze onto the cookies. Sprinkle with yellow sanding sugar if desired.